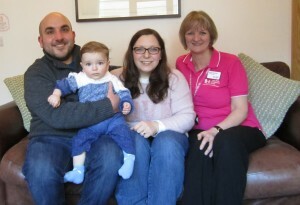 Guy and Vincenza (co-founders of Cartridge Depot) welcomed their son Dario Luigi Ciampa into the world on the 2nd May 2015, but there were a few complications when Dario was born which led him to be rushed to Addenbrooke’s Hospital in Cambridge. 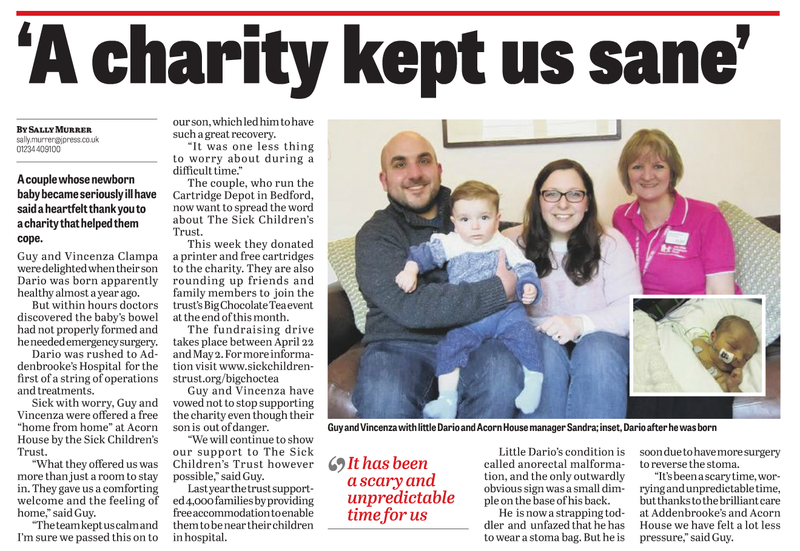 This is when The Sick Children’s Trust came in to help the family by offering them free ‘Home from Home’ accommodation during Dario’s treatment. Guy continues: “I was able to be close to my family and not worry about travelling and leaving them. I think we all take many charities for granted but when you actually use a charity like we did you realise just how important they are. “I felt it so important to spread this news about The Sick Children’s Trust and what a great job Sandra and her team do at Acorn House in Cambridge. 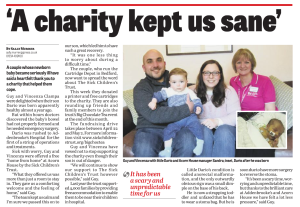 The Sick Children’s Trust makes a huge difference to parents, children and babies going through the most difficult times in their lives, so we are doing all we can to support the charity where possible. We’ve donated a printer and free cartridges from our company Cartridge Depot and we will also be encouraging other friends and families to join the charity’s Big Chocolate Tea event happening at the end of the month, so that more families can be supported by this wonderful cause. The Sick Children’s Trust runs ten ‘Homes from Home’ across the country and last year supported around 4,000 families with free accommodation close to their sick child’s bedside. Alongside private bedrooms, each house has communal bathrooms, kitchens and living rooms which can be accessed by the families receiving support. Acorn House Manager, Sandra Peckham says: “We’d like to thank Dario’s family so very much for their wonderful donation, support and kind words. The Sick Children’s Trust is working to a future where every family with a seriously ill child in hospital will be able to stay together, just minutes from their child’s bed during their treatment. We believe keeping families together significantly improves the recovery of seriously ill children. We provide free, high-quality ‘Home from Home’ accommodation, as well as emotional and practical support, to families with sick children in hospital in the UK. The Sick Children’s Trust was founded in 1982 by two paediatric specialists Dr Jon Pritchard and Professor James Malpas. Today we have 10 ‘Homes from Home’ at major hospitals around the country where families can stay free of charge, for as long as they need whilst their child is undergoing treatment. 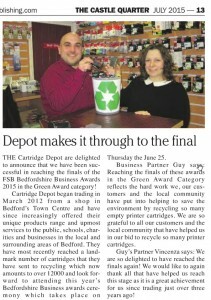 This news has also been published on the Love Bedford website & the Bedfordshire on Sunday website. 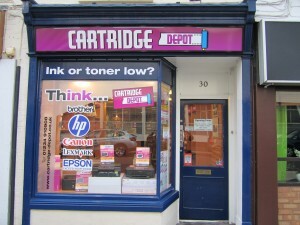 This year Cartridge Depot celebrated their 4th year in trading on the 19th March 2016. We would like to thank all for your continued support and look forward to offering our service for many more years to come! 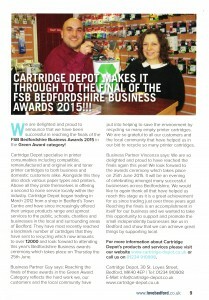 Cartridge Depot Employee Of The Year 2015! 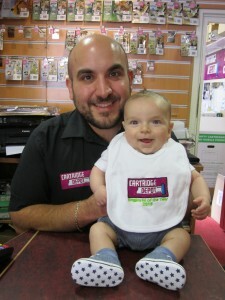 Cartridge Depot are proud to announce that they have chosen Dario Ciampa as there Employee Of The Year 2015! 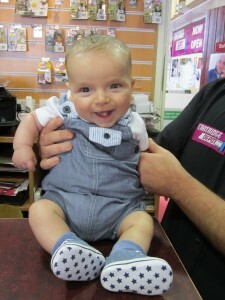 As you may be aware proud parents Gaetano and Vincenza welcomed their first beautiful baby boy Dario Luigi Ciampa into the world on the 2nd May 2015, at only 15 weeks old he has already managed to achieve the Employee Of The Year! Look at him, how could he not win it! Dario’s reaction on finding out he has won the Cartridge Depot Employee Of The Year 2015! 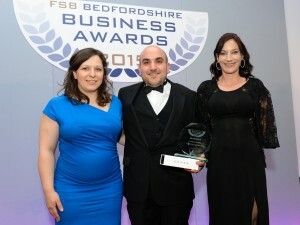 CARTRIDGE DEPOT ARE WINNERS AT THE FSB BEDFORDSHIRE BUSINESS AWARDS 2015! 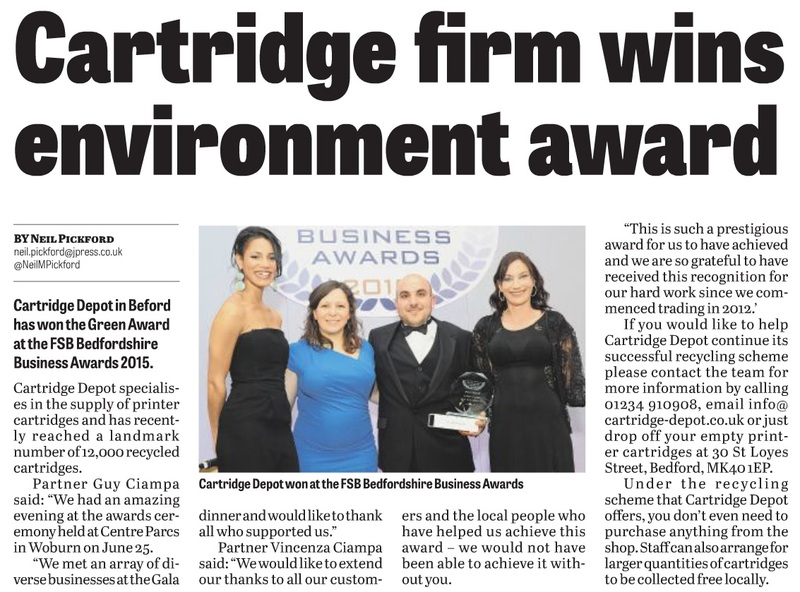 We are so proud, amazed and delighted to announce that Cartridge Depot are winners of the Green Award at the FSB Bedfordshire Business Awards 2015! 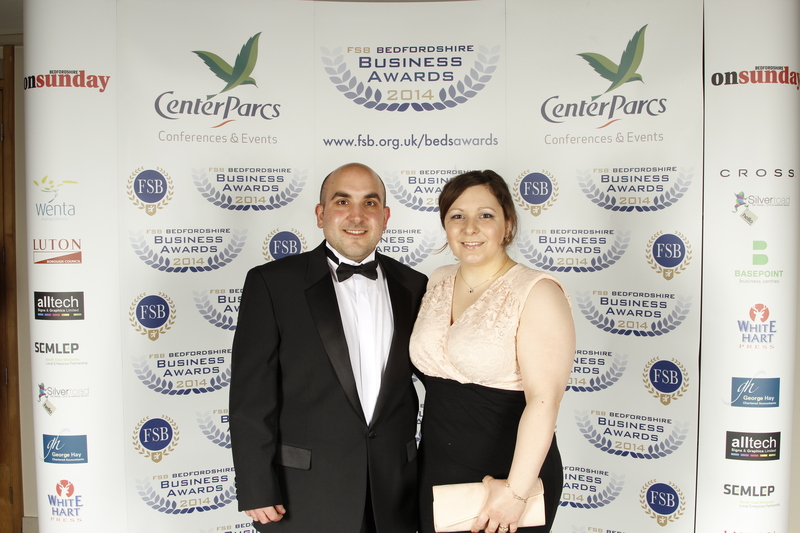 We had a great evening at the awards ceremony held at Centre Parcs in Woburn on Thursday 25th June 2015. We were lucky to meet an array of successful and diverse businesses from around Bedfordshire at the Gala dinner and would like to thank all who supported us. We would like to extend our thanks to all our customers and the local people who have helped us achieve this award, we would not have been able to achieve it without you. This is such a prestigious award for us to have achieved and we are so grateful to have received this recognition for our hard work since we commenced trading in 2012. 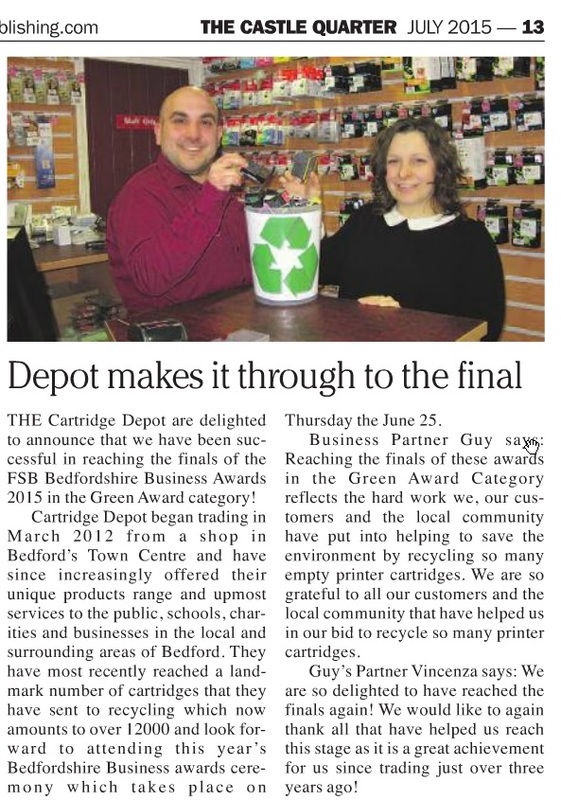 This news has also been published on the Love Bedford website & in the August 2015 edition of Business2Business. 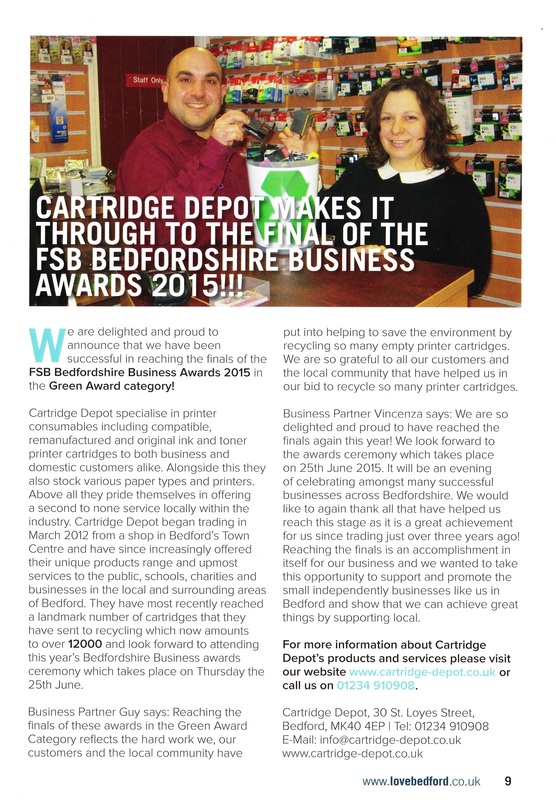 CARTRIDGE DEPOT HAVE REACHED THE FINALS OF THE FSB BEDFORDSHIRE BUSINESS AWARDS 2015! 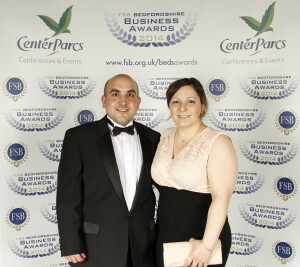 We are delighted and proud to announce that we have been successful in reaching the finals of the FSB Bedfordshire Business Awards 2015 in the Green Award category! 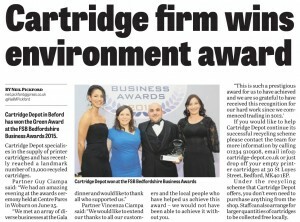 Reaching the finals of the awards reflects the hard work we, our customers and the local community have put into helping to save the environment by recycling so many empty printer cartridges. We are so grateful to all our customers and the local community that have helped us in our bid to recycle so many printer cartridges. We look forward to the awards ceremony which takes place on 25th June 2015. 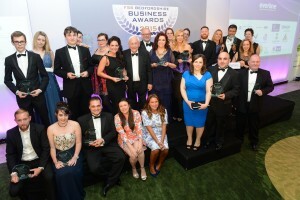 It will be an evening of celebrating amongst many successful businesses across Bedfordshire. We would like to again thank all that have helped us reach this stage as it is a great achievement for us since trading just over three years ago! Love Bedford & the Bedford Times & Citizen website. 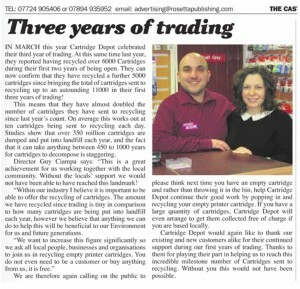 3 Years of Trading and Over 11000 Cartridges Recycled By Cartridge Depot! 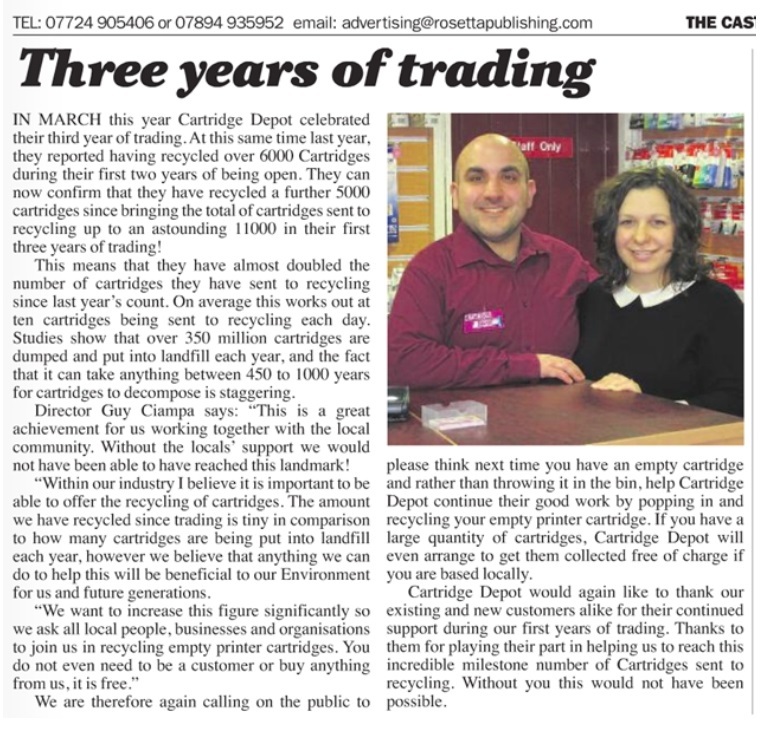 This year Cartridge Depot is celebrating their third year of trading in March 2015. 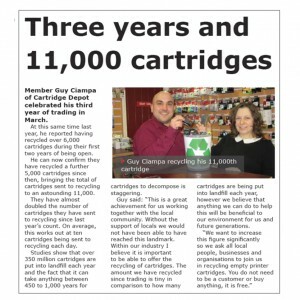 At this same time last year, they reported having recycled over 6000 Cartridges during their first two years of being open. They can now confirm that they have recycled a further 5000 cartridges since bringing the total of cartridges sent to recycling up to an astounding 11000 in their first three years of trading!!! 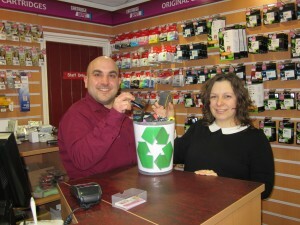 This means that they have almost doubled the number of cartridges they have sent to recycling since last year’s count. On average this works out at 10 cartridges being sent to recycling each day. Studies show that over 350 million cartridges are dumped and put into landfill each year, and the fact that it can take anything between 450 to 1000 years for cartridges to decompose is staggering. 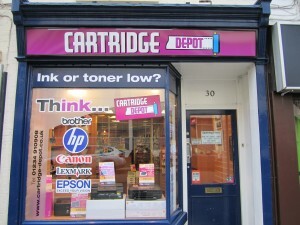 We are therefore again calling on the public to please think next time you have an empty cartridge and rather than throwing it in the bin, help Cartridge Depot continue their good work by popping in and recycling your empty printer cartridge. 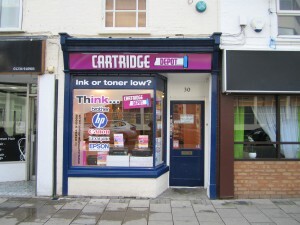 If you have a large quantity of cartridges, Cartridge Depot will even arrange to get them collected free of charge if you are based locally. Cartridge Depot would again like to thank our existing and new customers alike for their continued support during our first years of trading. Thanks to them for playing their part in helping us to reach this incredible milestone number of Cartridges sent to recycling. Without you this would not have been possible. Between the 28th March 2015 & the 13th April 2015 there will be a Easter Bunny Trial in Bedford and there will be £100 of Love Bedford vouchers to be won. Cartridge Depot will be one of the places you can find a picture of a bunny. Click HERE for more info. 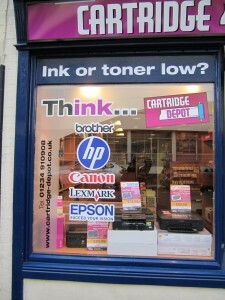 We recently got our shop front redesigned with new graphics, take a look at the pictures below! Vote for the best Independent trader in Bedford? 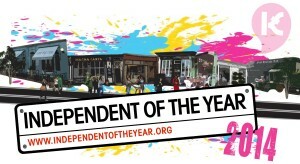 Its time to vote for your favourite Independent trader, in search for Bedford’s Independent of the Year 2014. From the 1st July 2014 to the 15th July 2014, local people can vote for their favourite Independent Trader. We’d like you to take part. After 2 weeks of local voting, the winner will go head to head for the national title of “Independent of the Year 2014”. Vote on Facebook by liking, commenting or sharing your favourite trader’s post. Visit facebook.com/lovebedford for a list of all nominees. We had an excellent evening at the Awards Ceremony last night, we met an array of different businesses from all around Bedfordshire. Unfortunately we did not win the Best New Business category that we were finalists in, but we were more than privileged and proud to be chosen and invited as finalist at such a prestigious event. We would like to again thank all our customers who have supported us since we began trading, we look forward to many more milestones like this one.